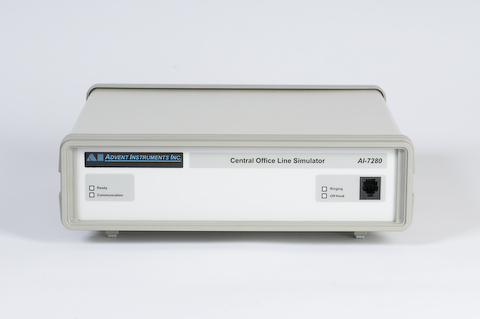 The AI-7280 simulates a single central office analog telephone line. It is designed primarily for the testing and verification of common terminal equipment, including standard telephones, Caller ID devices, SMS (Short Message Service) capable equipment, and any device using an analog Tip/Ring interface circuit. Supplying a standard RJ-11 telephone jack, the AI-7280 provides a programmable DC feeding circuit, operating in either a constant current or constant voltage mode. Both the line voltage and loop current are adjustable, including line polarity and slew rate control. An on-board ringing generator provides a range of programmable level, frequency, phase, and wave shape settings. All of the signal generation and analysis is performed by a programmable DSP, allowing for future firmware upgrades. The AI-7280 can generate up to four simultaneous tones including FSK (frequency shift keyed), AM (amplitude modulation), DTMF (dual tone multi-frequency), and MF (multi-frequency) signaling tones. In applications requiring signal analysis, the AI-7280 measures RMS level, DC voltage, frequency, and THD+N (total harmonic distortion plus noise) with a wide selection of adjustable filters. In addition it detects DTMF digits and decodes Bell 202 or V.23 FSK signals for Caller ID and SMS applications. 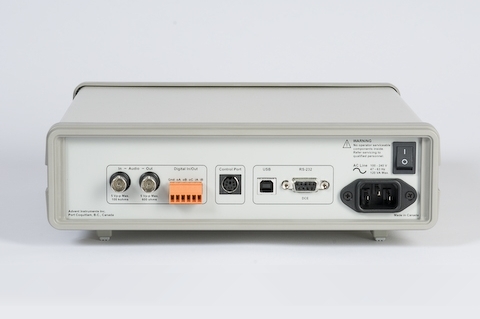 The AI-7280 connects to the PC via either a full speed (12 Mbit/s) USB 2.0 interface, or a legacy RS-232 communications port. Windows 2000, XP, or Vista is required to operate the TRsSim software. The supplied TRsSim application software provides a high level graphical user interface to the AI-7280. In its base form the TRsSim software can generate fully programmable ringing patterns and network tones. Additionally, standard TIA/Telecordia, ETSI, and DTMF based Caller ID messages can be sent to a TE under test. Other features include level, frequency, THD+N, and sweep measurements. As an optional component, the TRsSim software supports SM-SC (short message service center) emulation to either the ETSI protocol 1 or protocol 2 standard. Short Message Service (SMS) is the ability to send and receive text messages between various devices. Terminal equipment supporting SMS use the PSTN to establish a voice path with a Short Message Service Center (SM-SC). Once a connection between the TE and SM-SC is made, text messages are sent or received. The TRsSim software emulates a SM-SC for TE testing purposes. It can either receive calls from the TE for submission of text messages, or call the TE for delivery of text messages. The Advanced Caller ID option is a component to the TRsSim software. It expands the basic Caller ID capabilities to include more flexible control over the physical layer settings (FSK, DTMF, impairments, signaling & timing) and message layer settings (channel seizure bits, mark bits, message encoding, checksum encoding, mark out bits). This option is useful in performing compliance tests to various TIA/Telecordia, or ETSI Caller ID standards. For integration into custom test systems or for custom applications, a Windows compatible DLL is provided. It supports both a USB or RS-232 connection to the AI-7280, and can be accessed from virtually any Windows 32 bit development environment. This includes Visual C++, Visual Basic, Lab View, among others. The DLL Developers Kit provides the DLL driver and documentation required to develop custom applications using the AI-7280 Central Office Line Simulator. The driver contains over 200 functions for controlling tone generators, ring generators, telephone interface settings, DTMF transmission or reception, FSK transmission or reception, and signal measurement capabilities. The latest version of the driver includes a large number of high level functions simplifying the task of sending Caller ID or SMS data.